Courtney is just got back last week. YAY! And then I realised there was the last part of my wishlist that I haven't posted. These products are a little more miscellaneous but still things I would love to try, even if I buy these online later on. 1. Missha Dual Cuticle Pusher: Nail stuff is so cheap in Korea. But this cuticle pusher looks interesting with the different sized ends. 2. Y.E.T Nail Stickers: The designs look absolutely adorable. 3. Innisfree Eco Nail Color: These are my favourite Korean nail polishes. The brush is a great size. 4. Tony Moly Changing U Nail Patch: A mask-like treatment for your nails? Woah. 5. It's Skin Sense Boom Boom Hair Mist: Looks like a nice light hair treatment. 6. 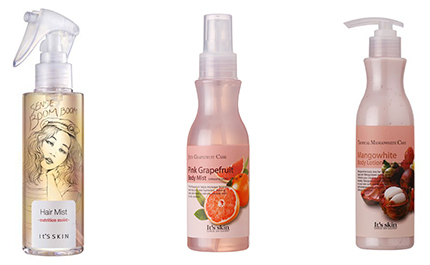 It's Skin Pink Grapefruit Body Mist: I love anything grapefruit scented. 7. It's Skin Mangowhite Body Lotion: Interested in how this would smell like. I find Korea body moisturisers absorb quickly and smell amazing. 8. Innisfree Daily Brush Cleaner: I really have not heard much about Korean brush cleansers. 9. VDL Botanique Hand Mask Gloves: I rarely use hand cream because I hate how sticky it is and I can't do much. So they need a lot of work right now. I also really like how they're actually glove shaped. 10. Nature Republic Peeling Foot Mask: We forget about treating our feet most of the time. This looks like fun to use. Once again these are very appropriately shaped. And that's the end of this mini series. Now I just have to save up to actually buy some of these things. [NOTD] by C: Minty & Cool and Ready for Summer! ©Made in Marcelle. Powered by Blogger. [EVENT]: Huge Blogiversay Giveaway! Made in Marcelle turns 1! [REVIEW] by C: I found my perfect lipstick! And 50% sale? [NOTD] by C: Ice Cream Nails? Donut Nails? You decide!